Adrienne Zihlman is being honored for her contributions to the study of human evolution. Photo by r. r. jones. Adrienne Zihlman, a professor of anthropology at the University of California, Santa Cruz, is being honored for her bold and pioneering work investigating human evolution. Zihlman has been selected as the recipient of the 2009 Martin M. Chemers Award for Outstanding Research in the Social Sciences. The award, announced by UCSC Social Sciences Division Dean Sheldon Kamieniecki, recognizes senior faculty members who have made major contributions through their research. Zihlman was the unanimous choice of the award selection committee. Zihlman's research has had major impacts on the fields of physical anthropology and human evolution. 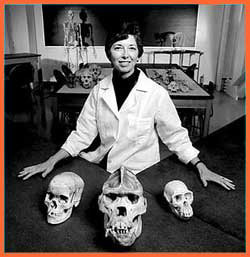 In the 1970s, her critique of the "Man the Hunter" model opened the way for researchers to incorporate the role of females in hominid biological evolution and in human cultural development, an approach that has since become mainstream. Zihlman's early work focused on locomotion and the transition to walking on two feet, comparing the anatomy of modern humans and other primates to the fossil remains of ancestral species. Her thorough and painstaking anatomical studies have broadly influenced the field of paleoanthroplogy. Zihlman pioneered the "life history" approach to physical anthropology and human evolution. Her work focuses on how anatomical differences reflect differences in lifetime behavior, and her findings have shed light on parenting behavior and the transition to adulthood. In the late 1980s, Zihlman launched another novel line of research when she began a painstaking analysis of individual chimpanzee skeletons whose life histories had been recorded by Jane Goodall and colleagues. She has continued to perform detailed muscle-by-muscle, organ-by-organ autopsies on recently deceased great apes--gorillas, chimps, orangutans--with known life histories, making an unparalleled scientific contribution, the implications of which are just beginning to emerge. Zihlman is currently preparing a major new reference book on the comparative anatomy of greater apes for the University of California Press. She is also the author of The Human Evolution Coloring Book, a widely used reference and teaching tool, and coeditor of The Evolving Female, a book that catalyzed a rethinking of human evolution that brought females and children back to center stage. Zihlman was elected in 1991 as a Fellow of the American Association for the Advancement of Science, and she has served since 1993 as Science Trustee of the California Academy of Sciences. She has appeared on the cover of several popular magazines, including Time and Discover. In 1998, she gave the UCSC Faculty Research Lecture.